Ah, our local pumpkin patch... appearing every year in the same empty dirt lot in the neighboring city just over the canyon from Malibu. My kids were so excited this September when it came to town, once again situated along the main road we travel so often to the many conveniences not afforded us on the coast, like Target and Costco and Whole Foods and Trader Joe's and... JUST EVERYTHING. So in the span of the two or so months the patch was set up there, we passed it countless times; and every one of those times my kids asked me to stop. They pleaded repeatedly and relentlessly, but I never did; instead choosing to get our pumpkins at Trader Joe's. I admit, it may not be as romantic of an idea to pick pumpkins out of a huge cardboard box in a cold market as it is to stroll through a sea of bright orange gourds littering the straw covered ground in the crisp Fall air filled with the scent of cinnamon and nutmeg. But the momentary guilt I felt from not giving my kids a warm and fuzzy pumpkin patch memory this year quickly faded when I discovered the huge pumpkin my son picked out at TJ's was only $5.99 instead of $35.99. We have visited many a pumpkin patch just for the experience - for the corn mazes, hay rides, and even bounce houses - without buying pumpkins sometimes. Underwood Family Farms has an amazing Fall Festival and pumpkin patch that I will happily take my kids to anytime. It was just that we were not going to visit this patch, not this season, not this year. And not because of the inflated prices. Because of the inflated slide. This year, they chose to erect a slide that was a huge, 25 foot high vinyl replica of the sinking RMS Titantic. Yep. You heard right. The sinking Titanic. AS A SLIDE. This haunting symbol of one of the worst catastrophes in modern history loomed over the patch, and as it cast its tragic shadow on all the Fall merriment, it beckoned the visiting boys and girls to slide on it. Every time we drove by, there they were, kids gleefully sliding down the diagonal "ship's deck" to the firm ground below while their parents and grandparents watched nearby on haystacks. Seeing this site for so many days, I couldn't help but wonder if all those adults were as blissfully unaware as their children and grandchildren were that, a little over a hundred years ago, passengers aboard the real Titanic slid down its real sinking deck in horror to their tragic deaths in the icy waters below. Or did they know exactly what happened and they just didn't care? I don't know who disheartens me more: the person who first came up with the idea for the slide, the people who looked at him or her and said, "Great idea! Let's create it! ", the vendors that purchase or rent one of them for their venues, or the people that allow their children to play on them. But what I do know is, that to me, it doesn't matter how long ago the tragic event happened. There is NO length of time long enough to make it okay or acceptable for someone to commercialize and trivialize a horrible accident that took so many innocent lives. 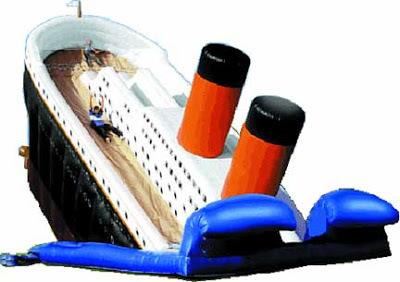 Sadly, the Titanic slide at my local pumpkin patch isn't the only one of its kind. there are others just like it popping up year round at Various fairs throughout the nation. When I first saw the slide and discovered that most people seemingly didn't mind it being there, it was one of those moments when I was challenged not to react. But it was hard. It was SO HARD. I instinctually wanted to proclaim my disdain and shout it from the rooftops so all those around me would know I disapproved. I wanted to stop and give that pumpkin patch owner a piece of my mind and let him know what a disgusting display it was and that he should be ashamed. I wanted my opinion to be heard, to know that it was counted. I wanted to make sure they knew I was not complacent... that I didn't think this was, in any way, right or acceptable. But I didn't. I didn't stop, and I didn't yell at the owner. I didn't do any of that. Instead, I just drove on by. Every time. I listened to my kids ask again and again if we could stop and if they could play; and again and again, I declined. Then finally, one day I decided to calmly explain to them why I would not ever stop there. I let them know that the ship the slide was modeled after was a real ship on which real people died. I told them that I didn't believe it was right for them to slide down that slide, smiling and laughing, when the people that were on the real sinking ship were scared and crying. I told them and they listened. My seven-year-old got it to a point, but that didn't make it any easier for her to accept and deal with my refusal to oblige her wishes. My four-year-old did not fully grasp the idea I was trying to convey, but he seemed to accept it nonetheless and moved on. This conflict between the outspoken, brutally honest me who doesn't shy away from telling the truth, and the mindful, non-reactive, working-on-becoming-more-enlightened me, is one I encounter often. And although I feel having opinions, convictions, and principles is wholly important and vital to one's character, I have also learned that "live and let live" is sometimes the best approach to take when you are presented with circumstances you cannot change; especially when your behavior is being carefully observed by two precious and impressionable small humans. So when that slide was finally deflated and folded away, I was glad to see it go. And although I know it may reappear next year to both offend me and delight others with equal gusto, I will continue to work on making peace with and accepting the fact that I can't control the world around me, that everything I oppose can't be a fight, and that I can't always push and pull so hard to try to make other people see things my way... even if I am right.